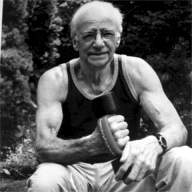 In 1982 Dr. Leonard Schwartz wrote, “Heavy Hands, The Ultimate Exercise”. It is an enjoyable book that is fascinating till this day. It contains many exercises including the “double ski pole” exercise. This motion follows the patterns of a Cross Country or Downhill Skier driving his poles into the snow and applying the full force of the body. Dr. Schwartz’ exercise uses handweights and a lunging step. You can do it on a track, uphill, (downhill can be tricky! ), or in the small confines of an apartment. You can stand in one spot with a foot in a cast and do it as well. According to Len Schwartz, this exercise has the highest aerobic out of any upright movement. In his experiments, the good Dr. has done this exercise with 23 % of his bodyweight for two hours. He logged 4200 arm cycles and 16,800 small paces. At 132 lbs. of bodyweight, this works out to be around 30 pounds total or two 15 lb. Heavy Hands. Previously he would spend days in bed with back pain. (Previous to changing his lifestyle). He said his back felt absolutely supple after this workout. Let’s do the math. For someone 150lbs. this would be 17.25 pound Heavy Hands. For someone of 180 lbs. it would be 20.7 lb weights. 200 lbs. ? ?…..Around 23lbs. You will have to construct your own Heavy Hands at those sizes. Dr. Schwartz has many custom made one’s and I have not seen them that size. You would need Dumbells with straps to relieve the overgripping that might occur without them. You can go here to get ones up to ten pounds. That is if you accept the challenge. man I was SO into these when I was doing my ultra endurance training. Made tons of sense to increase work capacity by including the upper body. Just look at the max vo2 levels of cross country skiers! somebody needs to give the good Doc a kettlebell and see how it stacks up.